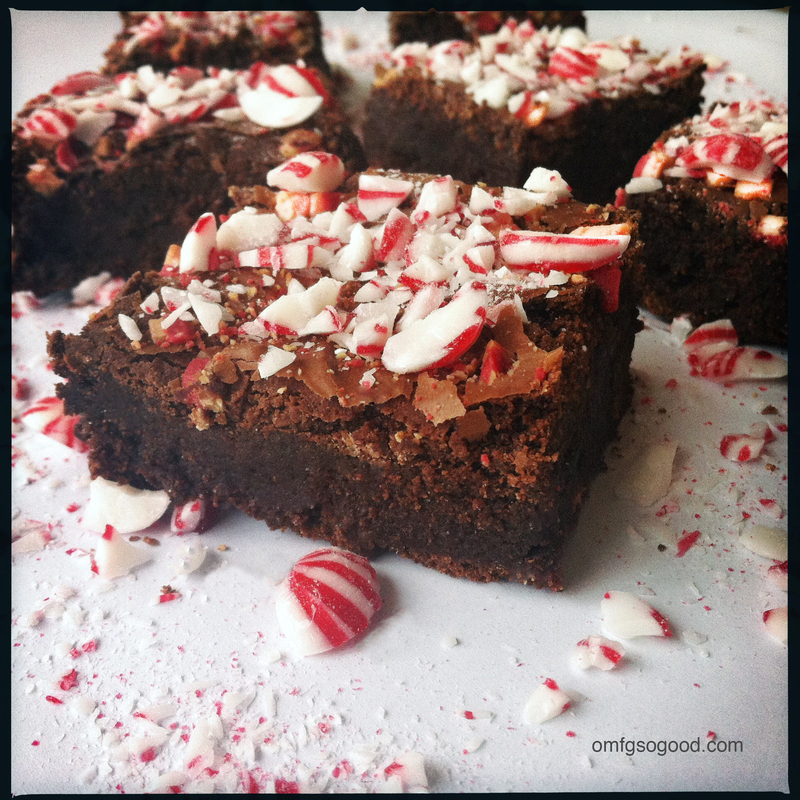 peppermint mocha brownies | omfg. so good. Raise your hand if you’ve got a giant pile of leftover candy canes stashed somewhere in your kitchen. Don’t be ashamed. I did too, but then I made these. 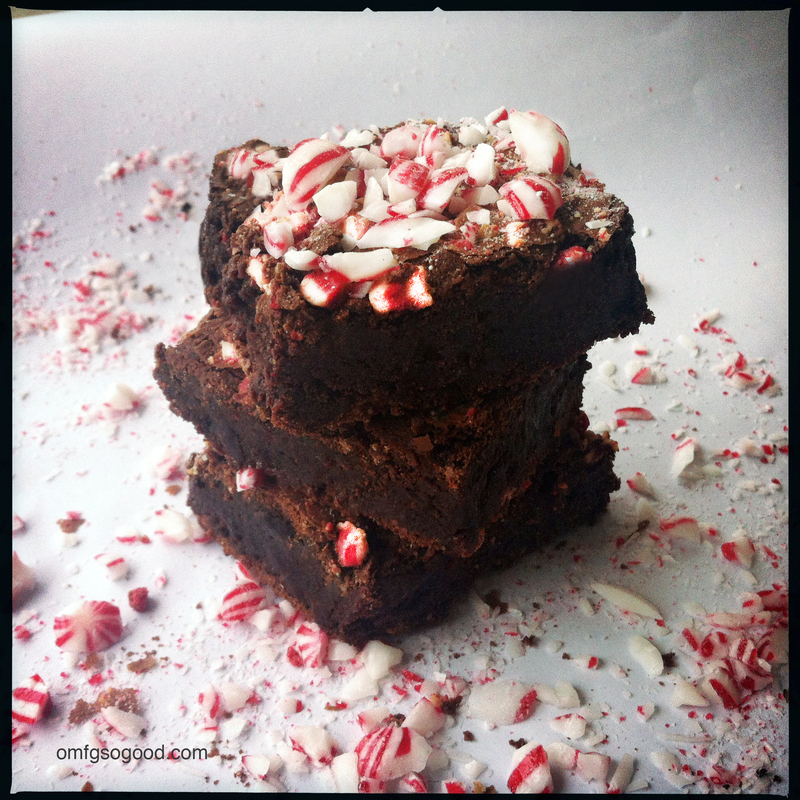 I have to admit I am a bit ashamed for missing the “Holiday Treat Recipe Rush” with these Peppermint Mocha Brownies, but whatever. To quote Pee Wee Herman, there’s a lot of things about me you don’t know anything about. Things you wouldn’t understand. Things you couldn’t understand. Things you shouldn’t understand. I’m a loner. A rebel. I’m starting a new trend with my “Use Up Leftover Candy That Nobody Actually Eats Unless It’s Baked Into Something Else” recipes. Don’t pretend you’re not intrigued. These brownies are decadently fudgy with the subtle hint of espresso and a cool peppermint finish, and the crushed candy cane topper gives them a great textural balance. Let me put it this way… if you could chew a Starbuck’s peppermint mocha it would probably be pretty spot on to one of these badboys. Preheat the oven to 375 degrees. Lightly spray a 9 x 13″ baking pan with cooking spray then line with parchment paper, draping over the sides to easily lift the brownies from the pan post-baking. In a small bowl, whisk together the flour, baking powder, and salt then set aside. In a microwave safe bowl, melt the chocolate and butter for :30, stir then cook for an additional :30. Remove from the microwave and stir to melt completely. Set aside to cool until just warm. In a medium bowl, whisk the eggs, brown sugar, peppermint extract and espresso together until combined. Add the egg mixture to the cooled chocolate, stirring until thoroughly combined. Stir in the flour mixture, then spread evenly into the prepared pan and bake in the preheated oven for 25 – 30 minutes, or until a toothpick inserted in the center comes out clean with moist crumbs. 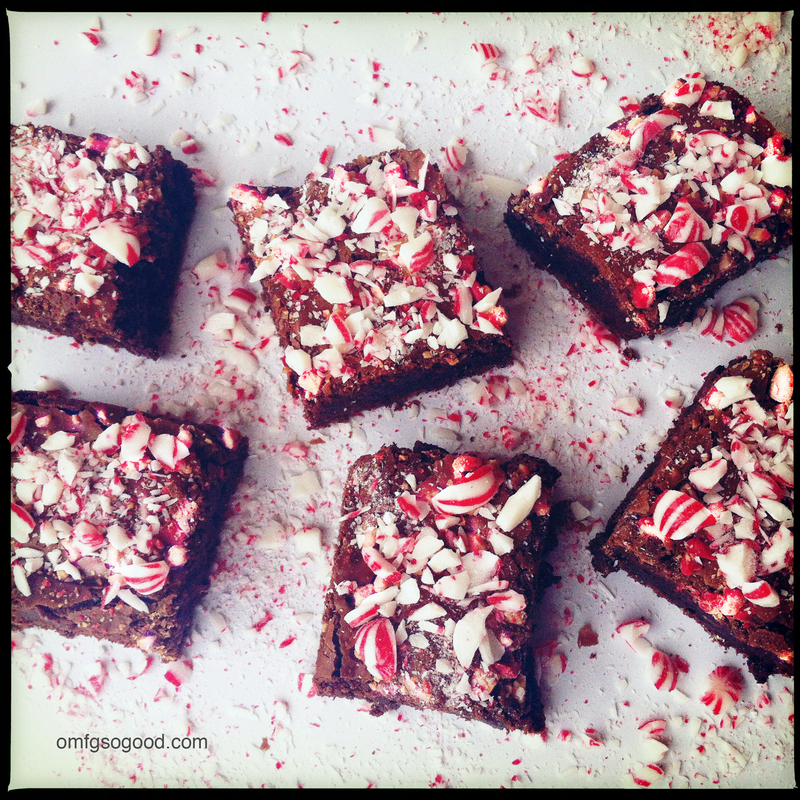 Remove from oven, sprinkle with the crushed candy canes and GENTLY press them into the top of the brownies. Allow the brownies to cool in the pan on a wire rack, then use the parchment paper to lift them out of the pan and cut into 24 squares. And here’s where I channel my inner Pee Wee once again. Candy canes are dirt cheap right now at your local grocery, Target or corner drugstore. No ‘Buts’ about it. Go get some and make these. And, be sure to tell ’em Large Marge sent ya. Ahhh, drooooooool. Why must these look so tasty, i have eaten way too much this holiday!